A recording of the first performance at the Festival d'Aix-en-Provence in 2012. This is the first DVD version of this rarely-performed opera, from Claus Guth's production at the Gran Teatre del Liceu in Barcelona in 2011. The performances are excellent, especially Jeanne-Michèle Charbonnet as Ariane. 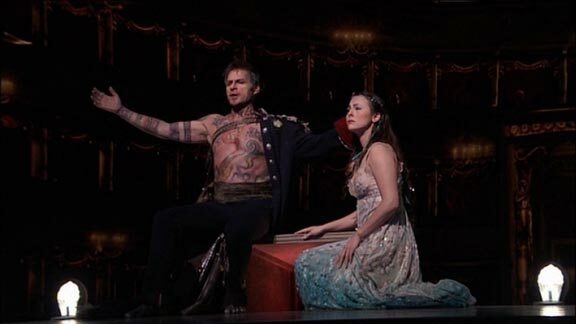 An outstanding production, originally broadcast as an HD Live transmission from the Metropolitan Opera in 2012. Rimsky-Korsakov's opera "The Legend of Invisible City of Kitezh" is often considered to be his greatest opera, but until this year only one version was available on DVD (the production by the Cagliari Teatro Lirico conducted by Alexander Vedernikov). Now this is joined by a new production by The Netherlands Opera conducted by Marc Albrecht, reviewed here. Prince Vsevolod, lost and wounded during a hunt, encounters Fevroniya living in the wilderness in Rimsky-Korsakov's opera The Invisible City of Kitezh. The opera is a mysterious work, apparently about prince Vsevolod who encounters the innocent maiden Fevroniya in the woods and takes her back to the city to marry her. As their wedding procession goes through a village it is interrupted by invading Tartars. But when the drunkard Grishka agrees to lead the Tartars to the city, the story changes from a historical tale to a metaphysical allegory: Fevroniya prays that the city will become invisible so the Tartars cannot find it, and although her prince has been killed by the invaders, they meet again in the Invisible City. This production by Dmitri Tcherniakov changes the setting from the time of the Mongol invasion to a post-apocalypse world in which Fevroniya has fled to the woods to escape what has happened to the Earth. The animals in the first act have become human refugees, and the second and third acts transpose the wedding celebrations into drunken debauchery among the survivors, and the Tartars into lawless skinheads. Although it's all visually entertaining, apart from the first act it seems very downbeat and ultimately depressing compared to the spiritual beauty that was intended in the original plot. The largely Russian cast give a superb performance, conducted perfectly by Marc Albrecht leading the Netherlands Philharmonic Orchestra and the chorus of De Nederlandse Opera, and Svetlana Ignatovich is particularly wonderful as Fevroniya, both in her understated acting, and in her captivating voice. John Daszak is compelling as the drunkard Grishka, and Maxim Askenov is also excellent as the prince. Thomas Adès's opera The Tempest is one of the most outstanding operas to have been composed in the last ten years; but despite a successful premiere at Covent Garden in 2004, a US premiere by the Santa Fe Opera in 2006, and a revival at Covent Garden in 2007, we have had to wait until the new version at the Metropolitan Opera in New York in 2012 before it is now finally available on DVD. Has it been worth the wait? Prospero explains to Miranda how they arrived on the island twelve years earlier, in Thomas Adès's opera The Tempest. This production was directed by Robert Lepage and originally broadcast as an HD Live transmission. Instead of the more literal sand-dune island used in earlier productions, Robert Lepage has set the action in a reconstruction of the La Scala Opera House. At first this seems a strange decision, but it works because it reflects the play's preoccupation with the relationship between the players and audience, and the way Prospero is using the island to stage the events that unfold. In creating the libretto Meredith Oaks hasn't so much adapted Shakespeare's text as created a totally new text, consisting of short rhyming couplets. In the first act the libretto feels a bit like a plot synopsis, with none of Shakespeare's complex language. But as the opera progresses her words fit perfectly with Thomas Adès's superbly expressive music, successfully conveying the atmosphere of the play. Audrey Luna as Ariel is breathtaking, singing at the upper extreme of the soprano range to convey the otherworldly qualities of the spirit, but sometimes her words are almost impossible to make out and so it's reassuring to have subtitles available. Simon Keenlyside is an experienced Prospero, having played the part in several of the opera's productions to date, and he is uniformly superb. Isabel Leonard and Alek Shrader are both excellent as the lovers, giving enchanting duets, and the scene at the end of Act 2 where their love breaks Prospero's spell and they walk hand in hand together into the sea is superbly staged and very affecting. Alan Oak is suitably repulsive as Caliban, and there aren't really any weak links among any of the other parts. One minor point – I would have preferred Deborah Voight's introduction to be moved into the extras as it makes a distracting start to the opera. But otherwise the filming and DVD production are superb, with excellent sound and picture quality. Highly recommended. 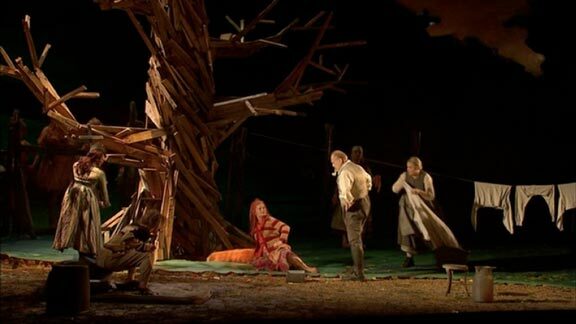 One of this year's opera DVD highlights has been Opus Arte's release of Janacek's opera "The Cunning Little Vixen" from the 2012 Glyndebourne Festival Opera production by Melly Still. The Forester discovers that the Vixen is a bit more than he bargained for, in Janacek's opera The Cunning Little Vixen. Inspired by episodes featured in a Czech newspaper cartoon strip, Janacek's opera isn't just a children's fairytale, but deals with the brutal cycle of life and death in the forest of Moravia. Melly Still's production succeeds admirably in conveying this, as well as the parallel lives of the animals and humans. Instead of using realistic animal costumes, the animals are dressed as humans, and their animal characteristics are conveyed with the help of props such as the Vixen's tail, which she uses as a weapon. The animals' sexual urges and aggressive instincts are portrayed with frankness; the Vixen's attack of the hens is particularly bloody. Lucy Crowe's singing and acting are both superb in the title role as Vixen Sharp Ears. Sergei Leiferkusis and Emma Bell are also excellent as the Forester, and the Fox who falls in love with her. Vladimir Jurowski conducts the London Philharmonic Orchestra with confidence, and the rest of the cast are also very good. Altogether a near-perfect production of this charming opera.